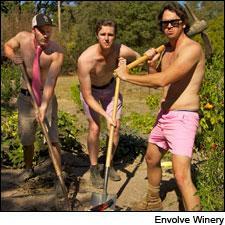 The men of Envolve Winery help root out breast cancer in seasonally appropriate garb for Sonoma. • Last we heard Sonoma winemaker and Unfiltered's perennial object of affection Ben Flajnik of The Bachelor fame, he was presenting the final rose to the lady who won his heart (if not viewers'), model Courtney Robertson. Now comes word that his winery Envolve—Flajnik and partners Mike Benziger and Danny Fay—is taking on a good cause with a two-pronged attack in the fight against breast cancer during Breast Cancer Awareness Month. First, the winery's "Real Men Drink Pink" campaign is promoting Envolve's 2011 Sonoma Mountain Rosé, proceeds from which will go to the Sonoma Valley Hospital Foundation, which offers free mammograms all month. The Envolve boys will also be hosting a pink-hued party on Oct. 20, pouring rosé and pink cocktails mixed by Danny Ronen of Liquid Kitchen. Tickets are $40 a pop (but free to breast cancer survivors), and that money will go to the SVHF as well. • Restaurateur and chef Karen Hatfield hosted the annual Pink Apron Dinner on Oct. 8 at Hatfield's in Los Angeles, also boosting funds for the search for the cure. Joining her in preparing the five-course prix-fixe feast were Mary Sue Milliken (Border Grill), Sherry Yard (Spago Beverly Hills), Suzanne Tracht (Jar), Dakota Weiss (NINETHIRTY at W Los Angeles) and Nyesha Arrington (Wilshire Restaurant). The wine list was in keeping with the ladies' night theme, with selections exclusively from winemakers who are women: J. Lassalle "Cachet d'Or" Brut Champagne, Dr. H. Thanisch Riesling, Vinja Barde made by Elena Parovel, Jean-Noel Gagnard by Caroline Lestimee, Grifalco della Luciana, Podere Casale by Elena Rigamonti and Domaine de Montbourgeau dessert wine. All proceeds from this fête des femmes are going to the Breast Cancer Research Foundation. • In keeping with the pink theme, Napa's Domaine Chandon is hosting its seventh annual Pink Party (dress code: pink) to benefit breast cancer programs at Queen of the Valley Medical Center Foundation. A silent auction at the party includes packages from wineries Cliff Lede, Melka, Modus Operandi, Quintessa, Pahlmeyer and Cornerstone, as well as Napa Valley Balloons, the Napa Valley Opera House and Chandon's own étoile restaurant. In addition, all month long Chandon will be donating $1 for every Chandon Rosé or Reserve Pinot Noir Rosé bottle sold and every "like" on Chandon's Facebook page to the National Breast Cancer Foundation. Over the last six years, the bubbly powerhouse has already raised in excess of $70,000 for breast cancer causes. • Sullivan's Steakhouse, a nationwide franchise with 19 locations, is also working with the National Breast Cancer Foundation by creating a special menu for this month called—you guessed it—the Pink Menu, a three-course, $39.95 prix-fixe; $5 from every order goes to the Foundation. Among the tasty dishes diners can choose from are a wild mushroom bisque with chive-infused oil, Cajun-dusted salmon fillet with truffle-red pepper chili butter, and crab, stuffed with shrimp for added pinkness. Over the last three years, Sullivan's has raised more than $395,000 in the fight for the cure. • Other wineries are getting into the giving spirit this month as well. Sonoma-based Cannonball Wine Company will give $5 to the NBCF for every new "like" on its Facebook page throughout the month. Up in the Northwest, Washington Hills debuts its fourth vintage of Pink Label Late Harvest Riesling, a 2011. For every case of the $10 wine sold, the winery will contribute $1 to cancer research and education programs. In the past three years, nearly $24,000 has been raised. • Finally, the do-gooders at ONEHOPE, an enterprise built around raising money for all kinds of charities, have set a lofty goal for Awareness Month: $100,000 for the NBCF, with the goal of promoting early detection of breast cancer. Their vehicle of choice is the ONEHOPE 2010 California Chardonnay; half of the sale profits have been pledged for the cure. As always, Unfiltered is heartened to see an ever-growing number of wine and food purveyors doing their part for the good fight. • Sad news this week from Italy's Piedmont region, where Angelo Rocca, owner of the Barbaresco winery Albino Rocca, died in an ultralight plane crash on Oct. 8. Rocca was piloting the plane, which went down near the city of Alessandria. The cause of the crash is unknown; there were reports of heavy fog at the time. Rocca's companion, Carmen Mazza, 55, also died in the crash. Rocca, 64, was an experienced pilot who loved planes and fast cars. His family has grown grapes in Barbaresco for more than a century, and his father, Albino, founded the winery in 1950. Angelo leaves behind three daughters, Monica, Daniela, Paola, and a son-in-law, Carlo, all involved in the family business. J. Lohr also funds mammograms. He lost his wife to breast cancer and believes in giving back. Thanks for bringing attention to another winery working toward the cure, Marlene. J. Lohr donates $2 from every bottle of J. Lohr Carol’s Vineyard Sauvignon Blanc and Cabernet Sauvignon sold to the NBCF; the program began in 2009 and so far has funded over 2,500 mammograms.